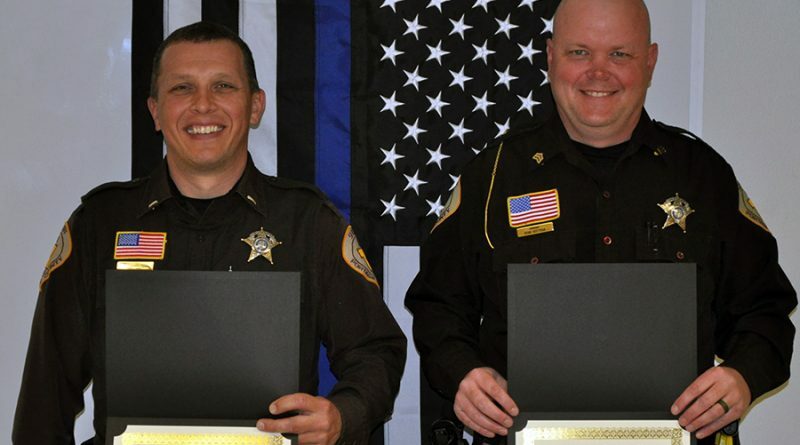 Two longtime members of the Portage Co. Sheriff’s Office were promoted on April 8. Jeff Coey was promoted to the rank of lieutenant and has been assigned to patrol shift commander. Coey worked in the Plover Police Department before being hired by the sheriff’s office in October of 2002. He has worked as a field training officer, drug investigator, detective, and team leader for the county’s Special Response Team (SRT, sometimes referred to as SWAT). Ryan Hoffman has been promoted to a sergeant and will also be assigned to patrol as a supervisor. Hoffman is a United States Air Force veteran and was hired as a deputy sheriff in June of 2007. He has primarily worked in the sheriff’s patrol division, also serving as a firearms instructor, field training officers, and member of the SRT.